EAST Hampshire members of the Ahmadiyya Muslim Community donated £500 from a sponsored walk to the chairman of East Hampshire District council’s charity. This money was raised during one of the three Charity Walks for Peace organised by the community in 2015, and which raised more than £300,000 for UK charities. During a meeting of East Hampshire District Council, the chairman, Cllr Tony Muldoon, received the cheque on behalf of The British Heart Foundation. Javaid Hameed gave councillors a brief introduction to the Ahmadiyya Muslim Community and its ongoing charity work. 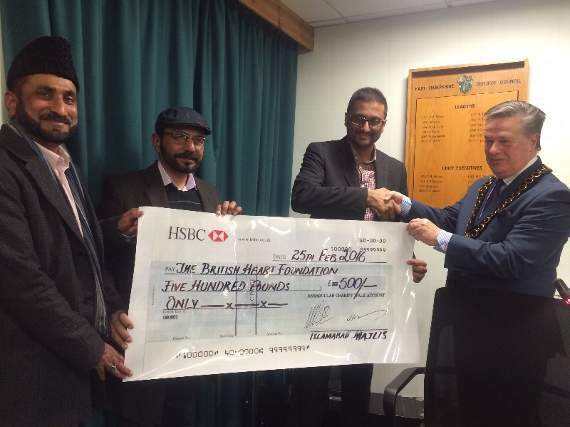 Share the post "East Hampshire Muslims present charity cheque"